In all countries visited the messages were similar: that the ‘best interests’, welfare and safety of the child are often forgotten or ignored in family law matters, in particular where there are allegations of family violence. Instead, the focus of decisions tends to be on the rights of parents, in particular on the rights of fathers. Since the focus of family law in each country has shifted to ‘shared parental responsibility’, many cases involving violence against children and mothers have not been adequately investigated and in some cases mothers and children have been put at risk by the decisions made. We also detected failures to provide access to fair and just court and administrative procedures. For example, in some countries we visited, the law makes it almost impossible for professionals with appropriate expertise to thoroughly investigate allegations as there is an emphasis on focusing on the future. After the completion of Nordic tour 2014, we recommend that a focus on the ongoing problems regarding violence towards women and children, is established on a Nordic level and through cooperation with the international society. On the Tour, we received reports about violence on many levels. Since the Nordic countries are often used as rolemodels for many other areas of the world, there is a need to pay special attention to this area if we are to live up to the ambition of the leader of UN Women, Phumzile Mlambo-Ngcuka, and prove to the rest of the world that violence against women can be eliminated. 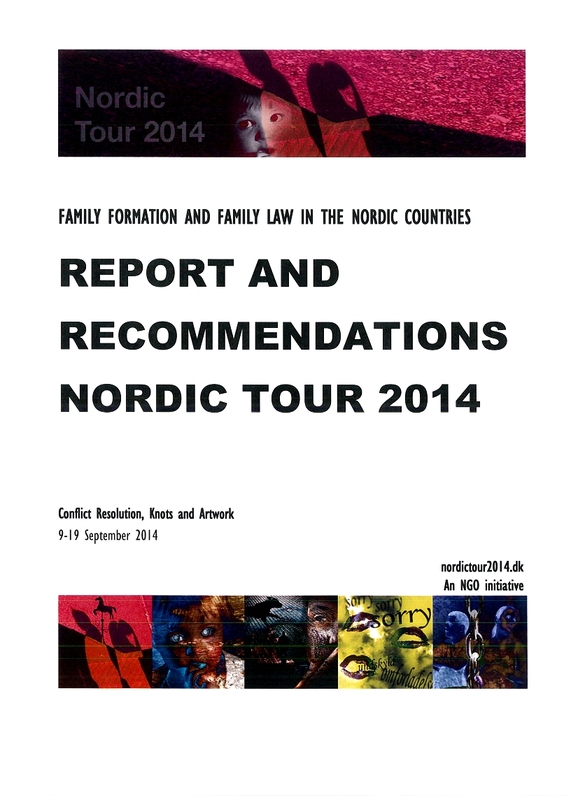 A probe of the family formation and family law in the Nordic countries with a special focus on whether steps taken to insure gender equality has lead to a special kind of violence. During the tour, a new type of violence against women and children were mentioned, a violence that consists of citizens being forced to cooperation and contact by laws and authorities, even in cases where violence and abuse has been proved. Some name this equality violence. Furthermore, it does not appear as if women’s special role in the reproduction has been taken into consideration when making the current rules – particuarly not the small children’s attachment to their mother. The probing of these circumstances could be done with a reference to the areas of special priority in the Council of Europe Convention on preventing and combating violence against women and domestic violence, also known as the Istanbul convention. Organising a Nordic conference, gathering international representatives for a discussion of the family formation and family law in the Nordic countries on a foundation of zero-tolerance with regards to violence and with recognition of and respect for the important role of reproduction. Establishing a think tank that can make specific recommendations for how to develop the family formation and the family law in the Nordic countries on a foundation of zero-tolerance with regards to violence and abuse and with a recognition of and respect for the important role of reproduction.